Whatever the request Linda takes a great deal of pleasure making sure the happy couple are delighted in every aspect of their really special day and the presentation along with the uniqueness of floral bouquets for the Bride and Bridesmaids along with Buttonholes and corsages provide a significant backdrop to the event. Weddings can be as small as 1Buttonhole and Corsage upwards to the requirements specified by the engaged to be married couple, which can also cover in and outside of the venue. Obviously prices vary and this can be dependent upon the availability of the floristry items. You can be assured that whatever the cost you will certainly receive value for your money and be secure in the knowledge that Linda will endeavour to delight you and the wedding party. This webpage can only provide limited information and the examples provided along with estimated costs are but a small sample of Linda’s work. Avalanche Roses White and Pink interspersed with foliage. Colours can vary througout the season. Bridal Shower Spray with White Roses, Purple Lisianthus and Pink Oriental Lillies. Bridal Shower Spray consisting of White Roses, Purple Lisianthus and Pink Oriental Lillies interspersed with foliage. Colours can vary througout the season. 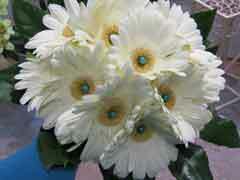 Bride and Bridesmaids Gerbera Handtie Bouquets. Bride and Bridesmaids Handtie Bouquets can include accessories such as Diamonte pins etc. Colours can vary througout the season. 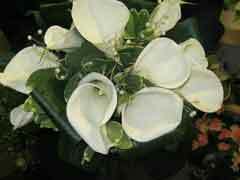 Calla Lilly, Aspidistra and Pittosporum Leaves. Calla Lilly Aspedistra and Pittosporum Leaves. Accessories such as Pearl imitations etc can be included. Colours can vary througout the season. Tulip Handtie and matching Buttonhole. 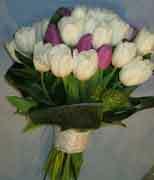 Bride and Bridesmaids Tulip Handtie Bouquets. Colours can vary througout the season. Prices start from £30.00 and £45.00 for Bridesmaid and Bride respectively. Button holes and Corsages to match start from £3.50. 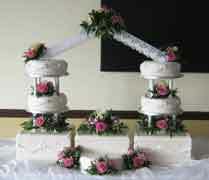 Pink and White Pedestal Arrangement colours and foliage to meet personal requirements. Colours can vary througout the season. Wedding Venue Accompanying Decoration Ideas. Wedding Venue Decorations are designed to enhance your special day and obviously centered on your wishes. These can take into account numerous variations and this example is one of many possibilities. Prices depend on your wishes and can be made available on request.